Using both lyrical and narrative forms, these concise verses explore a family history set against the larger backdrop of Mexican history, immigration, and landscapes of the Southwest. The poet's delicate touch lends these poems an organic quality that allows her to address both the personal and the political with equal grace. Straightforward without being simplistic or reductive, these poems manage to be intimate without seeming self-important. This distinctive collection ranges from the frighteningly whimsical image of Cortés dancing gleefully around a cannon to the haunting and poignant discovery of a dead refugee boy seemingly buried within the poet herself. The blending of styles works to blur the lines between subjects, creating a textured narrative full of both imagination and nuance. Ultimately, Empire situates individual experience in the wider social context, highlighting the power of poetry as song, performance, testimony, and witness. Addressing themes such as war, family, poverty, gender, race, and migration, Candelaria gives us a dialogue between historical and personal narratives, as well as discreet "conversations" between content and form. The beauty of Empire lies in the frankness with which Calendaria explores the complex history of a family and its past and present through poetry. It is very much a personal and intimate piece, and yet it encompasses much more by linking those personal experiences to historical events, and placing them in a political and social context. As the gorgeous summary above explains, Xochiquetzal Candelaria uses both the narrative and lyrical forms of verse throughout her works. The book is divided in three parts and has a total of 64 pages and, yet by the end, the reader has a sense of having read much more. "The white blue of daylight shrinks to a rip, and the geese seem to slip through but don't." "If I can say anything, I'll say I descended from a migrant bird." Two pages later I found Cortés and Cannon and was hooked. The strong imagery in this poem makes visualizing that amusing and celebratory moment more horrific by the almost tender momentary sense of connection Calendaria weaves in between Cortés and the Totonacs. Throughout, there are works that focus on more than the history or the sociopolitical. All of Candelaria's poems are personal, but there are some that touch on deeply personal subjects that reach the reader -- at least they reached this reader. 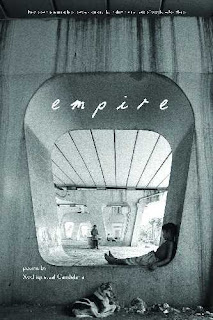 Of those, I loved Empire #1: Five and Dime Store 1949, Empire #2: Poet, Empire #3: Marriage, and Empire #4: Mirror. I read and re-read Empire #2 - Poet at least ten times, and I know I'll read it again. 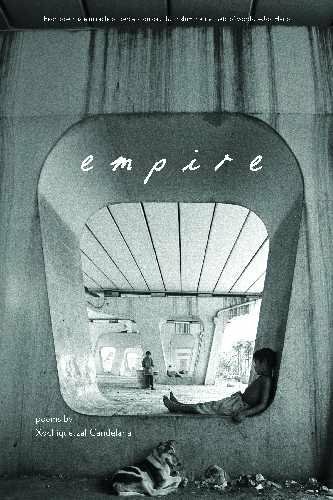 Empire is a book that I recommend highly, not for one read or even two -- take your time, think, savor and enjoy. I'll leave you with an excerpt and one complete poem. windows, crevasses along the eyes. Why repeat them? Did he think upon reflection we wouldn't select? to three more giving way. Fire breaks through as a seam in the center. is to sing and sing and sing. About the Author: Xochiquetzal Candelaria shares her first name with the Aztec goddess of love. She was raised in San Juan Bautista, California and holds degrees from UC Berkeley and New York University and is a tenured faculty member at San Francisco City College. Her work has appeared in The Nation, New England Review, Gulf Coast, Seneca Review and other magazines, as well as the online journal, Solo Ella. She was the winner of the 2006 Dorothy Sargent Rosenberg Poetry Prize, the Louisiana Literature Prize for Poetry, and the Gulf Coast Poetry Prize. In 2009, Candelaria received an individual literature fellowship from the National Endowment for the Arts.